I listened to an interview with Derek Sivers on the Tim Ferriss podcast a few months ago. His response to the question, “Who do you consider to be successful?” struck me. Derek’s observation led me to realize the success of my business has drifted from what I set out to achieve. Despite all the hype around entrepreneurs and entrepreneurship, starting a business is often uncomplicated. A person has a set of valuable skills other people are willing to pay for. They sell their skills, or the product they use their skills to create, and a business is born. 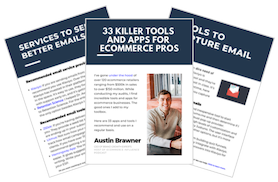 I started Ecommerce Influence to sell my email marketing skills and to learn how to grow ecommerce businesses. That was over three years ago. Since then I’ve gained momentum and more businesses want to hire me than I can work with. So I hired a team. We’ve continued to grow, and our success multiplied. Last year we landed our first $10 million dollar client. Then we landed our first $100 million dollar client. 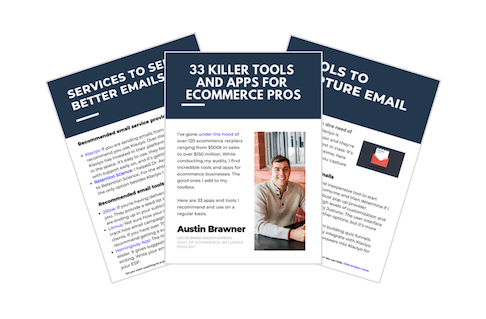 My one-man-shop morphed into a two-man-shop, and then an email marketing agency. As you build an agency, everything begins to scale up. Your overhead grows to reflect the larger scope of your projects. Your marketing must scale up to reflect the needs of your more established audience. And your sales process scales up too, moving from inbound to outbound reflecting your need for growth. This is fantastic if growing an agency is what you want, it has just never been my intention. In fact, growing an agency was the EXACT opposite of what I intended. As our agency has grown and had more success, I’ve found less time to do the work I enjoy. In the last 6 months I’ve spent less time working with clients, writing, and recording podcasts than I ever have. Instead of creating content, or exploring how to grow a business by interviewing business leaders, I’ve been focusing my time managing and growing an agency. That’s not the impact I want to make, so I’m changing course. I’ve decided to scale down my email marketing agency to spend more time doing the two things I enjoy the most. Personally helping entrepreneurs and business owners multiply their business. Writing and podcasting about growing an online brand. As a consultant, I’ve helped business owners go from concept to their first $100,000 in sales. I’ve helped companies grow from $1 million to $5 million and others grow from $10 to $20 million, and now I want to help you. Ecommerce Influence is where I’ll share strategies you can use to grow your business. Brand Growth Experts is where you can hire me and my team to execute them. I’ll be accepting limited one-on-one consulting engagements over the next year. Due to the time constraints of personalized consulting, the opportunities will be limited but rewarding. If you have an interesting project or concept, and you need help with email marketing or building the framework to get to the next level, let’s work together. If I can’t help you, I’ve built a strong network of service providers and I’ll connect you with someone who can.